The elephant fabric is great along with Katie Jump Rope! Love the elephants! Too sweet! And I like how there are unexpected circles tossed into the mix here and there. Beautiful. I love how you did the elephant fabric in circles here and there. It really makes the quilt unique. The fabric combinations are wonderful! So adorable. Do you have to do anything special when you quilt flannel with cotton? So cute! I always love your quilts! I'd love to hear a bit more about your experience in quilting flannel. I'm making my son a quilt with Urban Circus and I'd love to back it in flannel too! Very nice! 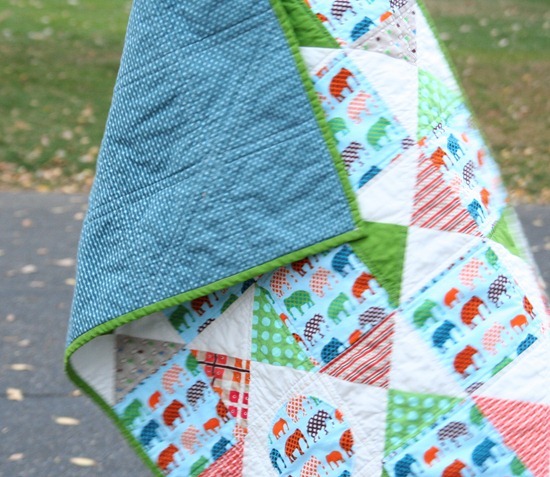 I just finished a quilt with this same elephant fabric – isn't it so fun? SO playful and wonderful colors! You never cease to amaze me with your freshness! I made my husband come to the computer to see this one. I LOVE it!!! I asked for Urban Circus for Christmas… hopefully you'll have a pattern for this so I can get it too! Allison, love, love, love this quilt! This is wonderful! I really like how you rocked the square and circle blocks and a nice colorway choice. Great pattern for those fabrics. Oh, cute! I like it! Darling, darling, darling. Love it. That quilt is so nice. I want to reach out and touch it. I also would like to know about a flannel background. Do you wash the flannel first? So gorgeous – where did you get this fabric and what is it called please? I must have some! PS. Do you have a pattern for this one?? That is such a great quilt! I wish my kids were still young – I'd have to make one for them. That is darling. The colors are great and the quilting really makes it pop! I love it. This is so adorable! I love it. Beautiful job! So fun! I love your choice of fabic! Just love it! So circus-y. very cute. love elephants esp for kiddos!! Thats darling! Love the fabrics you chose. Is the five minute garland post lost in space somewhere? Can't seem to pull it up. 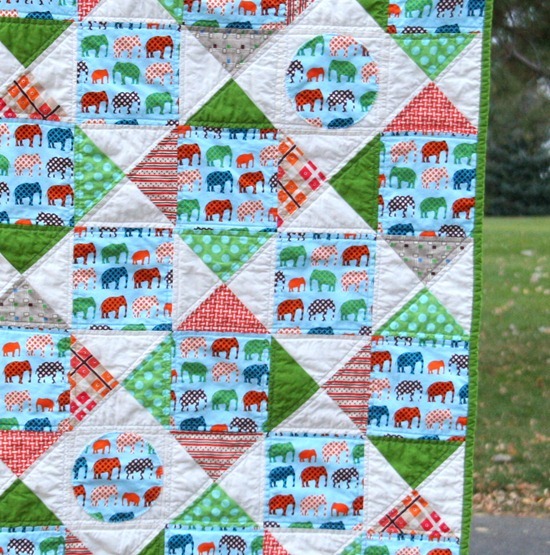 This elephants quilt is darling! it's so cute…^^ my niece would say it's "gajahku"
This is the cutest thing ever! But that's not surprising coming from you. haha I think I'm obsessed with every single one you've ever made. I absolutely love this quilt. Do you have a pattern for it?